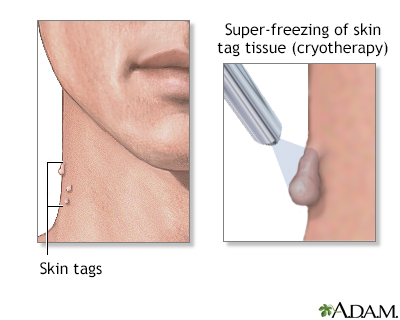 Skin tags are small growths of tissue on the skin's surface. They are usually benign and painless and do not grow or change. They can be found most anywhere on the body but are usually located on the neck, armpits, trunk, and body folds. The growths may be surgically removed by freezing (cryotherapy), or electrically burned off (cautery).